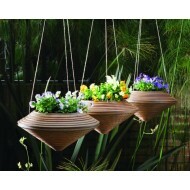 Hanging planters make a beautiful addition to any indoor or outdoor landscape project. They are a great way to incorporate plant life into busy commercial atmospheres without taking up precious floor space. 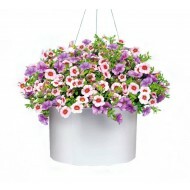 Use hanging flower pots in small outdoor areas, such as balconies and decks, or indoors where floor space is limited. Register or login to see wholesale pricing for hanging pots and plant hangers. Hanging planters can be heavy when filled with soil and water. Make sure you have reliable hardware in place to avoid damage to your client's property and your plant. Many hanging pots will come with built in drainage holes. If your plant container features holes with no tray to capture excess water, be prepared for a mess. Consider a hanger that features a swivel mechanism. This will allow you to maintain all sides of your plant with ease. Know where your client's air conditioning and heater vents are located. Most plants don't like drafts or low humidity levels.